By mid-March 2014, Russian “little green men” took full control of Ukraine’s Crimean Peninsula. And on March 18, President Vladimir Putin made a jubilant address to the Russian Federation Council (upper chamber of parliament) on the “reunification” with Crimea, asserting, “In people’s hearts and minds, Crimea has always been an inseparable part of Russia” (Kremlin.ru, March 18, 2014). The forceful dismemberment of Ukraine and the illegal annexation of Crimea produced an explosion of jingoist triumphalism in Russia, which effectively made most of its citizens accomplices in that blatant violation of international law and 21st-century norms of European inter-state behavior. 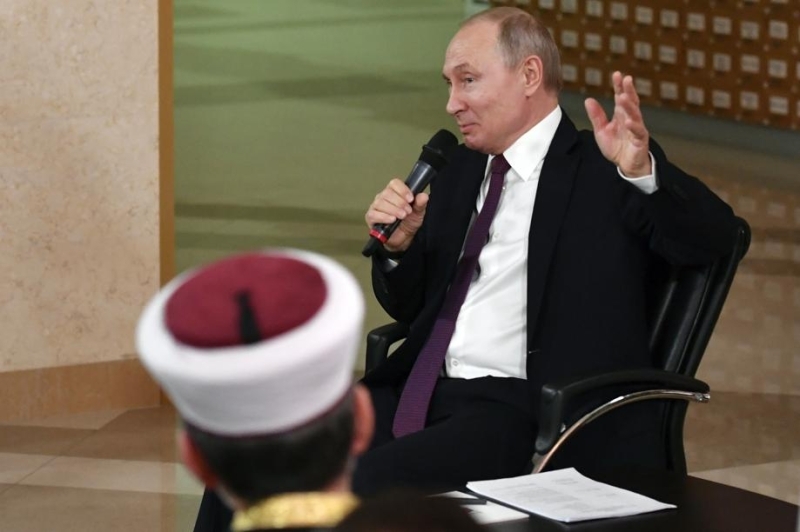 Since then, the “patriotic mobilization” has mostly dissipated and trust in Putin’s leadership has hit a low of 32 percent, according to the official pollster VTsIOM (Wciom.ru, March 3, 2019). Nevertheless, the incorporation of Crimea into the Russian state is broadly perceived as an irreversible fact, even if 46 percent of respondents (compared with 29 percent, five years ago) now feel that the country is headed in the wrong direction (Levada.ru, February 20). The strongest source of this “unpatriotic” pessimism is certainly the economy, which contracted sharply in 2015–2016, and then settled into a pattern of stagnation, responding only slightly to the volatility in global oil prices (Nezavisimaya Gazeta, March 14). Putin’s instructions to his cabinet to achieve an economic breakthrough (see EDM, May 17, 2018; February 21, 2019) betray apparent ignorance regarding even basic economic drivers, and the government has been taking the blame for registering only a semblance of low growth—largely by doctoring the statistical data (Moscow Echo, March 9). The new attention to social problems that Putin tries to demonstrate cannot alone reverse the trend of contracting real incomes; and it looks far less convincing than his passionate presentation of new missile projects, the costs of which have not been disclosed. Moscow continues to channel massive state funds—about 1 trillion rubles ($15 billion) since annexation, and counting—to Crimea, which generates only 0.4 percent of Russia’s GDP and accounts for 1.6 percent of its population. At the same time, the returns on heavy investments in transport and military infrastructure (including the Kerch Strait Bridge) are questionable (New Times, March 12). Perhaps the heaviest price for annexing Crimea five years ago is being paid by society itself. And though Russians are finally sobering up after the exuberance of territorial expansion, they remain exposed to malicious propaganda, which relentlessly fans anti-Ukrainian feelings (New Times, March 11). The demoralized society has accepted that there will never be a thorough investigation into the murder of Boris Nemtsov, a leader of the opposition who dared to vehemently condemn Putin’s aggression against Ukraine (Moskovsky Komsomolets, March 13; see EDM, March 4). The United States continues to demand such an investigation, but the Russian public’s attitude toward the US is strongly negative and resentment of Western sanctions obscures the fact that the counter-measures executed by the Kremlin are themselves badly detrimental to the health of the Russian economy. Presently, the main focus of these efforts is on ensuring the “independence” of the Russian Internet. The effectiveness of these “firewalls,” designed by adherents to Putin’s own vague ideas about how the Internet works, is by no means guaranteed—but the economic costs of such self-imposed digital isolation are certain (Vedomosti, March 10). One of the most worrisome shifts in public perceptions since the annexation of Crimea has been the growing belief in the inevitability of a major war, promoted by persistent propaganda campaigns. Some may appear comical, like the special train that has been traversing Russia and displaying captured “trophies” (including militants’ armed Toyota SUVs) from the Syria campaign (Newsru.com, February 27). But others are potentially more socially damaging, like the goal to engage up to one million schoolchildren as young as seven into the youth military-patriotic movement Yunarmiya, run by the defense ministry (Novaya Gazeta, March 13). This grassroots militarism is supposed to generate pride in Russia’s military might and to justify such sacrifices as falling incomes and curtailed social benefits. Though, such feelings are entirely foreign to most of Putin’s elites. Meanwhile, systemic corruption continues to afflict the Russian military-industrial complex. Sergei Chemezov, the head of the giant Rostec Corporation, has known Putin since their association as KGB operatives in East Germany in the late 1980s (Navalny.com, February 6). His lavish lifestyle can only be protected by diverting public anger to threats and plots of external enemies; and indeed, it generally fails to attract much indignation, even when exposed (Vedomosti, March 14). Relatedly, the delays and setbacks with deploying Putin’s “wonder-missiles” are caused not only by an aging industrial base, but also embezzlement at almost all levels of the defense bureaucracy. The cost of turning Crimea into a “military bastion” has, thus, swelled as a result of corruption, impairing rather than strengthening Russia’s security with this “conquest” (New Times, March 14). The multiple expenses, sanctions and punishments generated by the Kremlin’s fateful choice, which was embraced enthusiastically by most of the country, continue to accumulate (Kommersant, March 16). Whereas, that initial feeling of national unity has already largely dissipated, leaving behind grim indifference among the populace and increasingly painful repercussions to the elites who had profited from the annexation in the short term (Znak.com, March 15). For many Russian billionaires, the public investigations in the West into the dirty origins of their fortunes has, indeed, come as a shock (Meduza, March 4). Celebrations of the fifth anniversary of Crimea’s “homecoming” are far from joyful across the country. Even the peninsula’s major naval port city of Sevastopol, which hoped for a sustained inflow of rewards for its loyalty to Moscow, has had to learn to live in a state of permanent bankruptcy (Novaya Gazeta, March 14). Putin clearly perceives the willful decision to invade and annex Crimea to have been the high point of his “reign”; but as the euphoria dissolves into history, worries about the mounting costs continue to grow. The Kremlin leader could, perhaps, be content with a slow dignified decline, but many in his court find such a prospect risky or uninspiring, while Russian society, disoriented and disunited as it is, will not agree to forever remain hostage to its own blunder. Finding a way out of the Crimean trap looks next to impossible, necessitating tremendous hard work to rediscover Russia’s real destiny and dignity. But clearly, continuing to embrace the decaying Putinist system in its present form is not a viable option. This article was originally published on www.jamestown.org.